2017 was a stellar first year for the RAPID Manufacturing Institute. Fifty-six members joined the RAPID community—coming from industry, academia, government labs and other nonprofits. 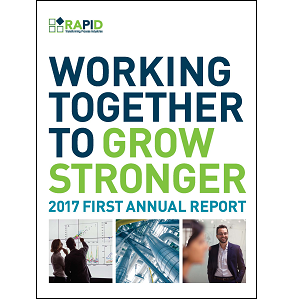 RAPID’s 2017 Annual Report, “Working Together to Grow Stronger” reflects the Institute’s efforts to create effective collaborations that result in breakthrough technologies and equipment..
“Our members are a diverse and robust community dedicated to implementing process intensification throughout the chemical, oil and gas, and pulp and paper industries—which are sorely in need of improvements in energy efficiency, sustainability, safety and cost containment,” stated Tom Walsh, RAPID’s interim CEO. RAPID is funded by the Department of Energy and embedded within AIChE. In 2017, 25 projects were selected out of 73 project call submissions representing $30m in federal funding and member cost-share. “These projects represent innovative thinking in regard to both technology and equipment design,” noted James Bielenberg, RAPID’s CTO.